More than ever, emerging technology is assisting individuals with autism in a variety of ways. However, many parents, schools, and special education professionals are not aware of the recent technological developments that are available to assist these individuals. 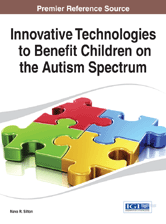 Innovative Technologies to Benefit Children on the Autism Spectrum brings together relevant theoretical frameworks and empirical research concerning the emerging technologies that benefit individuals living with autism. This book is an essential reference source for parents, teachers, special educators, researchers, academics, and other professionals seeking relevant information on the emerging technological advances available for individuals with neurodevelopmental disorders. Chapter 9: A Viable Option?